Grandmaster Joey Antonio, the reigning national champion, will not be joining the Philippine team bound for the 42nd World Chess Olympiad set Sept. 1-14 in Baku, Azerbaijan. The explanation offered by the NCFP: that GM Rogelio “Joey” Antonio, Jr. will be playing in the 2016 World Seniors Championship in November. Conspicuously absent is Battle of GMs national champion Rogelio Antonio, Jr., who reportedly begged off from taking his place in the national team to Baku. Infiesto said Antonio decided to represent the country in the 2016 World Seniors Championsips in the Czech Republic in November, along with Torre. The new average rating is up from 2462 to 2467, but will be the same 52nd seed if there no changes in the composition of the other teams. 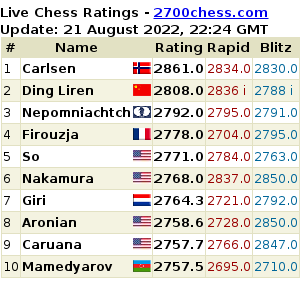 When in the Tromso 2014 Chess Olympiad, the Philippines played while enduring the pain from the loss of Wesley So to the US, I hope this time this is not an issue that can demoralize the players. Everything is changing except Phil. chess. No wonder Wesley Snipes left! Manood kayo ng tcec.chessdom.com/live.php chess engine tournament 24/7 ang laro guys promise walang Amoy isda Jan.. Houdini 4 and stockfish 7 fav engine ko these season 9. We finally had a meeting with Mr. Pichay today. The meeting was scheduled for 6pm. Wesley, Susan, and I waited and he was not there. We waited until 6:15pm then we had to go because Susan had to do a daily Press Conference at 6:30 pm. After the Press Conference, Wesley found Mr. Pichay. But he decided not to meet us alone. He brought with him 2 additional people. The first one he introduced to us was Mr. Canobas, VP of the NCFP, and the second one was Mr. Legaspi, board member of the NCFP. The conversation started out on friendly term for about 2 minutes. Then I was immediately attacked for updating the facts on this issue on Facebook. They considered this a personal attack to Mr. Pichay. I responded by saying that I am not attacking anyone. All I did was state the facts, and I asked them to point out any wrong info. They could not. All they kept repeating is it is your facts, not ours. I then asked them please tell me what I wrote wrong. They refused. They said why should they respond to me? Who am I? This is not my business. I explained to them that I am his coach, and I also represent Wesley in chess related matters because his Mother asked me to help him. Mr. Canobas said to show them the contract. Susan then said that our agreement with Wesley is not of their concerns. Even though Wesley confirmed to Mr. Pichay and Mr. Canobas about my position, Mr. Canobas said that unless we can show them a contract, this matter is not our business. He then attacked us and accused us of making money off Wesley. We explained to him that not only we do not make a penny from Wesley, we put in our own time and money to help him. It appears that he does not believe in the concept of anyone helping others without any personal benefits. – Mr. Pichay said that he would personally consent the transfer but the board refused. In addition, he cannot do it because Mr. Garcia of the PSC will cut $500,000 in funding to the NCFP immediately. I explained that according to the interview(s), Mr. Garcia said that Mr. Pichay is the one who can make the decision and no funding will be lost. Mr. Canobas and Mr. Pichay both said that it is not true and we do not understand how things work in the Philippines. I asked for them to explain to me but they refused. They insisted that they are telling the truth, and the PSC is playing games. – Mr. Pichay said that even though he likes Wesley; he will not jeopardize the funding to the NCFP from the PSC. This funding will be used to build many more Wesley So. I asked what the difference is between now and 11-12 months later when he is gone anyway? This way he can save his career. They repeated that we do not understand how things work in the Philippines and if they release Wesley, Mr. Garcia will cut the funding to all chess players in the Philippines. Therefore, it is their duty to protect the interest of the chess federation and not Wesley. – I also said that if he is released now in amicable terms, he will likely come back and gives back to the Philippines when he reaches his goals. If Mr. Pichay personally punishes him now, he will never go back to the NCFP. They will then lose him forever. His answer was he does not care if Wesley comes back or not. That is his decision. During the meeting, Mr. Legaspi was very respectful and Mr. Pichay showed his political skill by not answering any direct or difficult questions. His position was we just simply do not understand how things work in his country. In the meantime, Mr. Canobas was clearly trying to intimidate us by shouting and raising his voice. I have never seen anyone treating a woman in this manner, especially a World and Olympiad Champion. It was also very disrespectful for them to ignore both Susan and I on numerous occasions and spoke to Wesley in Tagalog. They basically repeated to him the same mantra about what did they do wrong to him to warrant a federation transfer. It was clear that they were trying to make him feel guilty. Mr. Canobas said that they (the NCFP) built him and our last 2+ years of helping him was irrelevant and it meant nothing. He got his success because of the NCFP. And when Susan asked them again to speak in English, Mr. Canobas told Mr. Pichay that they should end this useless meeting. Mr. Canobas said that this is a Filipino matter so stay out of it. Then they stormed out of the room without even shaking our hands. Ncfp staged the BOGM National Championship as gualifying tourney for Baku Chess Olympiad.. I read earlier NCFP reason that Antonio gave way bec he opted to play in World Senior with Torre. 1st, isn’t it that if the federation is after country’s interest, he will keep antonio to play in the most prestigious event in chess. Topping the recent bogm is a proof that antonio’s skills is needed in the team. And Since the World senior does not overlap the olympiad. Antonio can still play in the world senior after he plays in the olympiad. 2nd what for is the bogm qualifying tourney w/c they (ncfp) staged if they will not follow the result. 3rd if ncfp decides to in john paul gomez since technically he is qualified for bagging 3rd in the recent bogm, why not remove the player with the lowest bogm result? I hope the federation does not misuse its right being a private organization who is independent and autonomous of its decision. Otherwise, we will be left with nothing. Players will continuosly go abroad and seek greener pasture. Sagar Shah: Olympiad 2016! Team USA are the second seeds and are one of the favourites to win the gold. How does it feel to be a part of the USA team as a player? Last time you were a coach! Wesley So: Okay, it is way too early to even be saying the word “gold”! But otherwise it’s amazing to be given such a chance. Of course there are many great teams standing in the way of a gold medal, so let’s not count our chickens. We may never know the real reason why GM Antonio gave up his spot. Philippine chess will never improve as long as it is run by these buffoons.